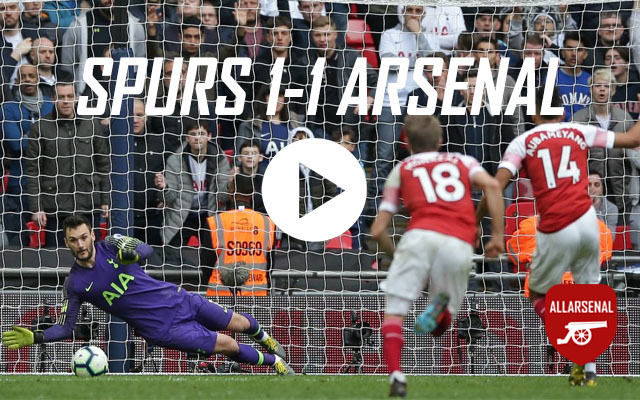 Arsenal 1 v 0 Tottenham: A hard fought victory shows North London is still red! One of the biggest fixtures of the year, even at this early stage of the season everyone knew the North London Derby was a must win game. As ever, the players were fired up and you can see it means just as much to them as it does to the fans to get the win. Recently, players, fans and pundits have been speaking out about how the Spuds have overtaken us. So after their summer spending spree of over £110 million, it was time for Spurs to literally put their money where their mouth is. The team sheet pretty much wrote itself, with Cazorla moving to the left to replace the injured Podolski, and Rosicky taking his place in midfield. The only shock was that Jenkinson was at Right Back in place of Sagna, who was on the bench suffering from illness apparently. Laurent Koscielny rejoined the side and the rest of the squad remained unchanged from Fulham, with ‘new’ signing Flamini on the bench. The match began with Rosicky and Walcott each earning a free kick on the edge of the box, Cazorla taking them both. The first heading for the top corner, excellently saved by Lloris, and the second drilled under the jumping wall, drifting agonisingly wide of the post; a positive start. We needed to quickly find our rhythm and get some possession, as the first 15 minutes saw some excellent wing play from Chadli and Townsend. 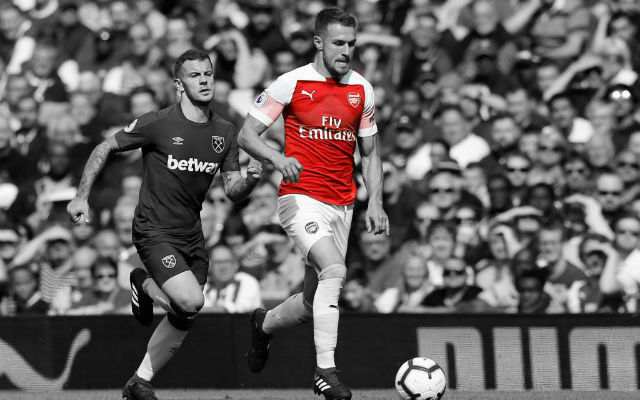 It seemed as though the pair were going to cause Jenkinson and Gibbs problems all night, and while it certainly restricted their ability to get forward at times, as the game went on the Full Backs found the right balance and contained the threat well. 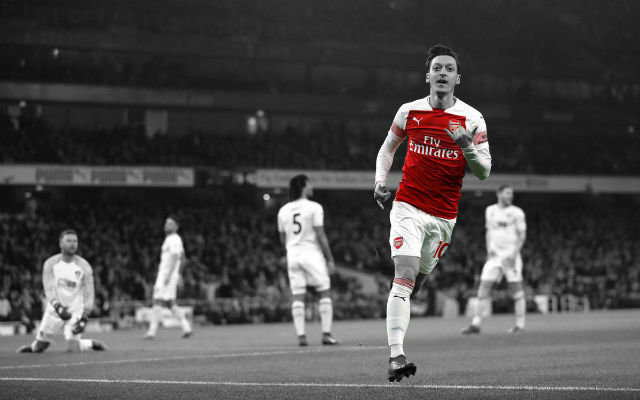 The next few minutes saw spells of possession from both sides but neither really threatening the goal, Arsenal defending corners well which is reassuring to see. 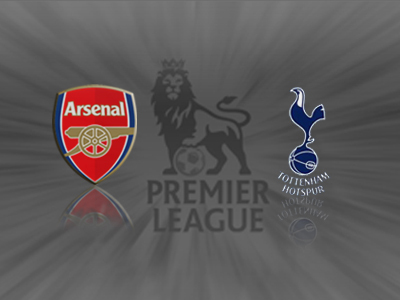 The deadlock was soon broken however, when Tottenham committed men forward to an attack and Arsenal were able to counter. Cazorla played a ball from deep to Ramsey, and it looked like the attack might lose some of it’s momentum when Ramsey turned away from goal, but he spread the ball wide to Rosicky who in turn played in Walcott who was being kept onside by a very untidy Spurs back four. 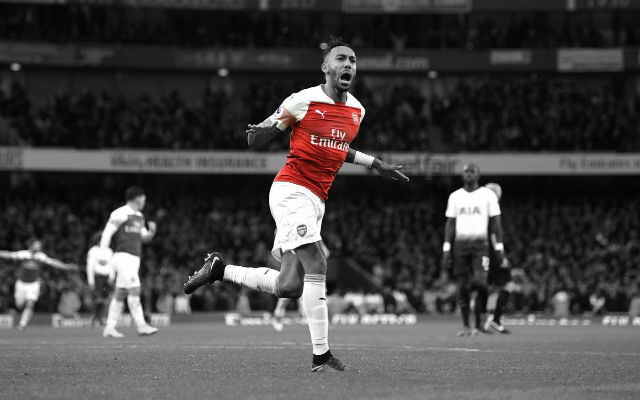 Walcott squared the ball across the box to Giroud, who managed to get in front of Dawson at the near post and slip the ball neatly past Lloris with a delicate flick, where it nestled into the corner for his third Premier League goal of the season and Arsenal’s first goal of the night. 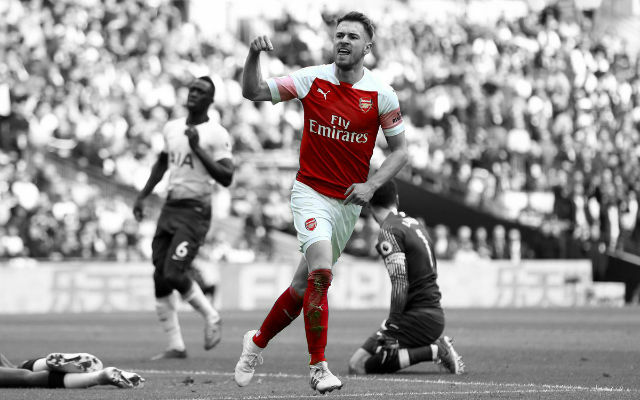 Moments later some great build up play gave Ramsey an opportunity to double the lead, and on his current form you wouldn’t bet against him. His shot ballooned over the bar though and it was a wasted opportunity by the Welsh youngster, who should at least have troubled the Goalkeeper. His miss was soon forgotten however, when some quick passing between Rosicky and Cazorla set Walcott free, and had his first touch been slightly better, an onrushing Lloris might not have got a toe to the ball just outside the box to deny him; great play by the Arsenal! The rest of the first half was fairly quiet, with Tottenham’s only real threat coming from the wings and a few Townsend long shots. Wilshere was mysteriously subbed off in place of Flamini just before the end of the first half, and I’m sure more than a few of us feared the worst, suspecting his ankle had flared up. Thankfully it was later confirmed that he was just suffering from an illness, presumably the same one that kept Sagna out of the starting eleven. You could see that Jack was devestated to miss the rest of the derby, he’s truly a player who bleeds Arsenal. The second half started much in the same way as the first had finished, with Tottenham having more of the possession. Flamini looked his rugged, forceful self, with a hard tackle on Danny Rose. He took the ball well but unfortunately the referee deemed it a dangerous tackle and he was shown a yellow card, despite the protests of the Arsenal players and fans. 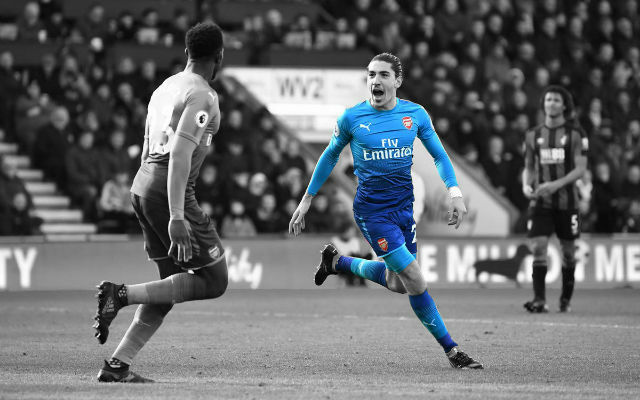 Giroud nearly made it two after another counter allowed Santi to find him with an excellent pass, his first touch wasn’t the best but he struck the ball well. It took a deflection but still needed a strong hand from his compatriot to keep it out of the net. The fans were in uproar moments later when they felt he handled outside his area, the ref dismissed it though on the advice of his linesmen. Walcott made another fantastic run off the back of Dawson, Giroud almost found him with a nice pass, but there was a little too much power on it and Lloris was again out quickly to deny the Englishmen. There was a 5 minute delay for an injury to Capoue after he seemingly fell on Cazorla, and the resulting free kick led to Tottenham’s best chance of the game so far. The ball was cleared, but only as far as Defoe, who rifled a shot through a host of bodies. The shot took a deflection off Koscielny and Szczesny needed some quick footwork and strong hands to keep the ball out of the net. The danger wasn’t cleared properly and the ball bounced around the area before being sliced high and wide by Walker. Some great play by Giroud down the right touchline saw him beat 2 men before cutting it back to Walcott, Theo’s shot was blocked by Lloris but it looked as though it was going to fall for a tap in to Monreal, who had just been brought on for Rosicky. He somehow missed the ball completely however, and the opportunity to put the game to bed was gone. With the 5 minutes added time for Capoue’s injury, the last few minutes were as intense as you will see in any game today, with the Spuds spraying crosses in from every direction. Sagna was brought on for Walcott to sure up the defence a bit and we certainly needed his strength and aerial presence. 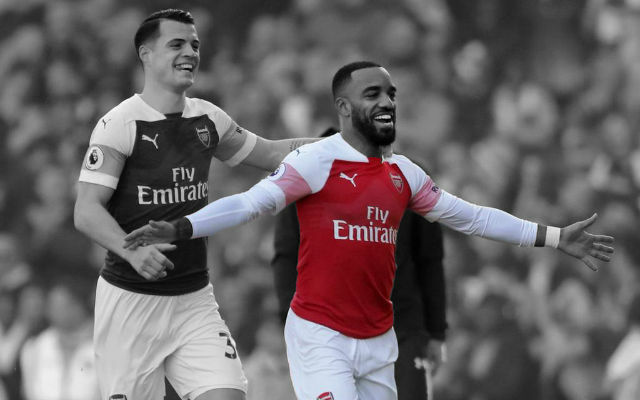 Despite some heart in mouth moments right at the death, our defence stood fast and it was a fantastic hard fought victory, showing everyone that despite the rumblings along the footballing grape vine, North London is most definitely still red! It was a very important game for us. It was our fourth game in two weeks and I knew in the last 20 minutes we could suffer a bit physically. But overall it was a convincing win in a very intense game. It was a bit uneven technically, we had moments where we lost some balls that we don’t usually [lose], but in the end we hung on. There were aspects to our game that people are not used to seeing from us – that means commitment, desire, defending. Their keeper was their best player, and that shows we had the chances to win really comfortably. I am one of the few who never doubted that. This team has lost one game since March in all competitions. You don’t do that with an average spirit. No, you [the press] spent a lot of time in finding another striker for us! Maybe that woke something up in him. I like what he did today, because technically it was good, he had a huge physical presence. He looked to me today that he had a exceptional quality performance of a real centre forward. I said it was a no-brainer [to sign him], I am just sorry that he did not cost £25 million! Overall his performance was exceptional. He hasn’t played since May but his performance was very convincing. I am not against spending money, but I want to add super quality to our squad. Tottenham got a lot of money for Bale, they have to invest it – I understand that. The need is different for us, we need one or two super players and we will try to add that. We have 24 more hours, so maybe we can surprise you. Maybe not – but I am confident. Yes, because it is a little bit like a domino game. Maybe something will happen in the last 24 hours, maybe not. It is very difficult to predict. I am ready to pay what we can afford, even if it is a bit over the market [value] and as long as it is not crazy. I am not against spending. We finished with three centre backs because I knew in the last five minutes we would need some heading in the box, and I think Sagna saved two headers in the end. Of course you are worried because you could see the other night when Chelsea defended [against Bayern Munich] and in the last few minutes the ball bounces off someone and it could be 1-1. That is part of the game. We did not have the resources anymore to play and just wanted to defend. You need a bit of timer when you buy many players, that is normal. But the players they have bought are quality, you could see that today. You always need a bit more time when you are buying more than three players. He has a stomach bug, but nothing that will stop him from playing for England. Yes. What has happened to us, happened to Tottenham a few years ago.